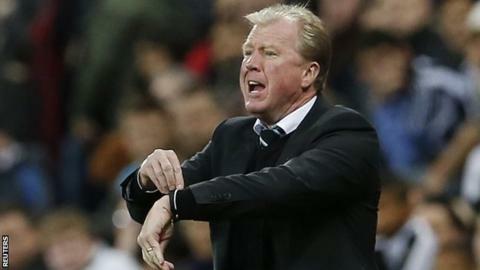 Newcastle should keep faith with boss Steve McClaren, according to former Magpies centre-back Steve Howey. McClaren, who was only appointed this summer, has guided United to 19th place in the Premier League and they were knocked out of the League Cup by an under-strength Sheffield Wednesday. "To have that knee-jerk reaction and look for a new manager is ridiculous at this point," Howey told BBC Sport. "We have to wait until at least Christmas." Howey helped Newcastle win the second-tier title as well as being part of a Magpies side which twice finished as runners-up in the Premier League during the 1990s. He believes the Tyneside outfit's players need to "take a long hard look at themselves". "Everyone can get beaten and we have already seen that this season but it is the way, attitude and sometimes how easily they go down," added Howey. "When I was playing, and even afterwards, teams didn't like coming to St James' Park because it was hostile and it was difficult to win there. "The way Newcastle are playing at the moment, they are basically there for the taking which is horrifically disappointing. The fans expect better." Newcastle host champions Chelsea on Saturday, with the only team below them in the top flight being rivals Sunderland. "It wouldn't be the same in the North East if there wasn't all this turmoil," said Howey. "Every year they say it's going to be different but it ends up being the same. The football at the moment is not even good. "If Newcastle and Sunderland don't buck their ideas up you can see them both going down and Middlesbrough coming up. "This area is a hotbed of football. It's a pity the teams aren't as good as the fans are."